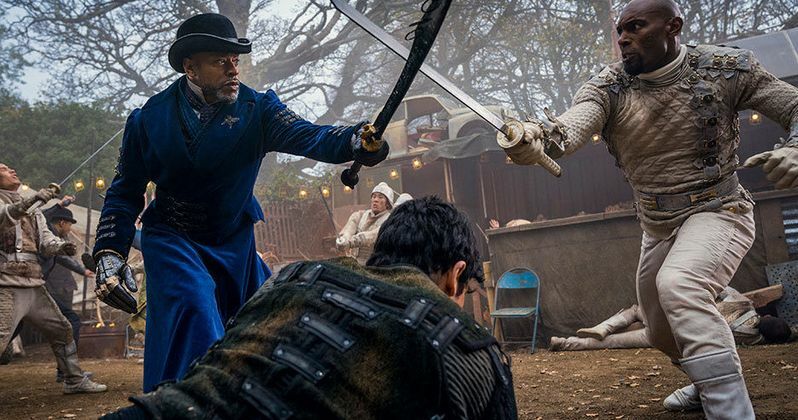 At the end of last week's Into the Badlands episode, we saw Gaius Chau (Lewis Tan) get stabbed while he was in a battle with Castor (Dean-Charles Chapman) and was thought to be left for dead. But instead, he somehow was able to sneak off from everyone and stow away in the trunk of the Widow's (Emily Beecham) car. When they arrive at the gates of her base and discover him, she is unaware of who he is until he calls her by her regular name of Minerva. In Carry Tiger to Mountain, we flashback many years and are shown a house full of children watching a puppet show being put on. Through the show, we are told the story of Horatio Chau who became the first Baron of the Badlands and now this lineage was carried on by Baron Alexander Chau (Hon Ping Tang) who was the father of Gaius and Juliet Chau (Eleanor Matsuura). The puppets have little swords and reenact a historic fight that resulted in one getting its head chopped off. The children cheer with giant smiles on their faces when this happens and while it is a proper indication of life in the Badlands it is quite disconcerting. We see a young red-headed girl named Minerva who was a servant to the Chau's and Gaius had a boyhood crush on. When she accidentally drops a tray of glasses in front of the Baron, Gaius goes to help her and cuts himself in the process. This infuriates the Baron and he wants Gaius to punish her by giving out ten lashes but he can't bring himself to carry it out. However, Juliet has no problem stepping up and she happily carries out the lashing herself. Minerva is then thrown into a pen with rabid animals because lashing is only the appetizer. This seems like the result of how the Widow and Chau became enemies in the beginning. After we come out of the flashback, Gaius shows that he still has some feelings for Minerva and offers to help her take out his sister. The Widow seems hesitant to accept and instead just orders him to be locked up. Speaking of Baron Chau, Pilgrim (Babou Ceesay) is none too happy about the men she sent to kill him and arrives at her property with a gift of the men's heads which he rolls at her feet. Knowing she has to come up with an immediate defense she blames her brother and says it must've been him acting out. I can imagine what Thanksgiving is like around their house! Knowing she is lying Pilgrim chooses to just use this to his advantage and tells her that she must give him one thousand workers for a "special project." Pilgrim doesn't care for her excuses and lets her know she better make it happen. As they leave, Chau does notice that Gaius' head is not among the fallen. At the Widow's home, Moon (Sherman Augustus) has returned from the blind cannibal's and she notices that he now has his old sword back. She assumes this means Moon killed Sunny (Daniel Wu) but when he tells her he let him go she is very disappointed. He stands by his reasoning that Sunny has a child and that the boy shouldn't grow up an orphan. The Widow is not sold on this line of thinking and she threatens him that if Sunny gets in her way again, she'll kill him as well. She is one tough lady to work for. Sunny, is traveling with Baji (Nick Frost) through the snowy mountains as they make their way trying to find the witch known as Ankara (Clare Higgins). They finally come upon her place which is an old wrecked plane on top of a frozen lake. Only a place like this could exist in the Badlands. When they go inside there are many drawings on the walls of Azra that look like caveman drawings that we used to see. Seemingly out of thin air Ankara appears and she recognizes Baji and accuses him of coming to kill her. He scoffs at the accusation and instead Sunny walks up to her with Henry and asks for her help. She takes one look at the child and she can already tell he has the Gift. "Why did you bring a Dark One?" she asks. This doesn't seem to be going in the right direction. When Bajie says they couldn't take him to the monastery because it wasn't safe she reveals the only help she can give will be temporary. She can't take away his dark gift. Sunny being desperate tells her to do whatever she can. She pours a tub of water and submerges Henry in it. As he cries out Sunny is alarmed but when he goes to take him out, Ankara touches his chest and uses his life force to funnel it into Henry and we see the smoke of the dark gift leave his body. The procedure appears to work but Ankara says they will need a more permanent solution. The answers are inside of Sunny himself whom she says is a catalyst for the dark gift. She puts her hands on his face and we see inside his mind strange memories of him being a small boy on a boat during a storm. A hooded man comes up to him and wielding some of the power in his fingers, taps young Sunny on the forehead. But this act somehow comes back to reality and the power throws Ankara's body back across the room--she gets up dazed but all right. She tells Sunny that whoever has "locked his darkness" is more powerful than her. MK (Aramis Knight) wakes up to Nix (Ella-Rae Smith) dabbing his forehead with a cloth and freaks out because he doesn't know where he is. He gets up and tries to leave which is just crazy because any normal guy would have no problem with Nix taking care of them. As he tries to leave Pilgrim and Cressida (Lorraine Toussaint) enter and tell him to stay and rest. MK activates his Gift to try and break out but when Pilgrim sees this he uses his strange powers again and just by saying "Peace be with you," his Gift goes away. Suffice to say MK is very thrown off by this action and doesn't seem to know what to do next. Pilgrim offers to help him deal with this inner pain he has but MK says he has to find someone, the man that killed his mother. Pilgrim goes to work and says he will help him with this and he should join their group in their journey to find Azra. MK takes notice of this since he has long sought it out as well and he agrees to stay with them. As they shake on this, the one person who is observing all from afar is Castor and he is not happy about this because he feels like he is being replaced. And as we know, truth be told, MK is his replacement. Ankara takes it one step further and says there must be a reason that fate has brought Sunny and Bajie together on this journey. This upsets Bajie because he is still holding on to the resentment of listening to her beliefs about the city of Azra when they were at the monastery. All of the time he followed her and it turned out to be nothing but making him look like a fool. She is the reason that he went into the tower and tried to send out a signal to contact some outsider to come save them from the Badlands. But as he tells her, "no one came." Ankara then walks over to a panel and pulls out a huge metal box which is making a beeping that sounds like Morse code. But Baji tells her he knows that it isn't his signal and she confirms he is right-it is in fact Pilgrim's! So Bajie is responsible for bringing this maniacal wannabe messiah to the land, good job. I say that mainly because Pilgrim's message reads "We will cleanse the land and prepare for Azra's return." He's not talking about creating a book club that's for sure. Pilgrim also says in his message for people to come to the "temple where the rivers meet." Bajie isn't sure where this is but he thinks he knows someone who might. Before they leave, Ankara gives Sunny a map to Pilgrim's Island and tells him that he is the one that can save his son. Another journey it is! Back over on Pilgrim Island, Nix is showing MK some slides with the View-Master of Azra and it seems to bring them together a little more, but that's before Castor comes in like a jealous high school boyfriend. He accuses Nix of going out and getting MK as his replacement and tells MK that he's not like them because he doesn't have to cut himself. This rage in him causes his nose to start bleeding and as he leaves we see Pilgrim and Cressida have been secretly listening in the whole time. Cressida tries to convince Pilgrim that he needs to let Castor go because he doesn't have much time left and MK is an even more powerful replacement. But like a stubborn father, he will not give up on the boy and also tells Cressida that "Castor is not some creature to be dispatched at your bidding." Those words will have some significance very shortly. For a brief moment, we spy in on Baron Chau as she tries to figure out where she can get workers to satisfy Pilgrim's order. Her second-in-command Otto (Wayne Gordon) suggests the refugee camp that is now being run by Tilda (Ally Ioannides) and she approves the idea. Later on, Castor approaches Cressida and asks her for a remedy to help him with his condition. She tells him there is nothing that she can do to cure him but he can still do something to help their cause. She tells him about the workers that they are supposed to be getting from Chau and that he needs to go out and make sure they are brought back to them. But when he says he's going to get Nix to help, Cressida instructs him to do this alone. She addresses the power of his Gift and says that if this is the last time he is able to use it they will "rejoice in the glory of your sacrifice." She is manipulating Castor to go on a suicide mission which is a very risky idea because I can only imagine how Pilgrim will react to her disobeying EXACTLY what he just told her. At the Widow's home, Moon (Sherman Augustus) has returned from the blind cannibal's and she notices that he now has his old sword back. She assumes this means Moon killed Sunny (Daniel Wu) but when he tells her he let him go she is very disappointed. He stands by his reasoning that Sunny has a child and that the boy shouldn't grow up an orphan. The Widow is not sold on this line of thinking and she threatens him that if Sunny gets in her way again, she'll kill him as well. She is one tough lady to work for. As she discusses what to do about Gaius with Lydia (Orla Brady), she is hesitant to trust him because every man she has ever known has betrayed her at some point. While Lydia obviously understands since she was once married to the villainous Quinn, she also tells Minerva that at some point she has to trust someone so she can gain the advantage in this war. Plus the fact that Gaius was imprisoned by his own sister for already going against her once should count for something. The Widow decides to pay Gaius a visit in his cell to help her decide his fate. He reminds her how they used to be friends but Minerva disagrees and says they were social classes apart. He asks her about the time she got thrown into the pig pen and wants her to tell him how she got free. She plays along and says he should know what was left behind and he has no problem answering that by saying it was a dagger with the words "No Mercy" inscribed on it. She looks back at him in complete silence so that means he got her good with that one! Gaius has won the Showcase Showdown! But he'll have to collect his prize package when he actually gets freed. He follows his answer up by saying that even though they come from different worlds but they believe in the same thing. C'mon Minerva, don't you see you have an ally here?! It would appear his words had an effect on her though because when they learn of Chau's convoy spotted on its way to the refugee camp she enlists him to join her fighters in intercepting them. At the refugee camp, we see Tilda and Odessa (Maddison Jaizani) enjoying a small moment of happiness because they have learned they have enough supplies to make it through the winter. But as expected in the Badlands this would be short-lived because they hear a commotion outside and when they look through the window they see Chau's men setting their camp on fire! The inexperienced refugee fighters try to defend themselves but are cut down easily by the attackers. Those that are just trying to flee from them are captured and thrown into the back of the truck to be taken back. Castor is also with them on a motorcycle that he has armed with two swords on the opposite ends of the handlebars. He zips around slicing through several of the refugees and he has nothing but the look of determination in his eyes to help make the mission a success. But while he is distracted with his bloodlust, Tilda throws out a whip and wraps him up bringing him down off the bike. He activates his Gift to fight her but she doesn't show any signs of backing down and they spar back and forth. Their fighting leads them into the train car and Castor gains the advantage by several punches to her chest and goes in for a choke hold to take her out. Just when it seems like he might win the Widow's troops show up and ignite a gas explosion next to the car that sends them both flying in different directions. With Moon, Gaius, and Minerva leading the charge, Chau's men now have a whole new threat to deal with. The Widow tells Tilda to get her people to safety while she takes on Castor herself. Gaius matches up against Otto which will definitely let her know where his loyalties now lie. Moon and Odessa have the unlikely pairing of fighting together for a few moments until they find Gaius and make a three-person front against Otto who realizing they are now outmatched, turns and runs away. Inside the train car, Castor and the Widow have an exciting sword battle but she puts him on his back in the end and instead of taking his life she takes him prisoner. Pilgrim takes MK to the mainland where he has dozens of workers digging on a site where he says something sacred is buried. He tells him that once they uncover it, they will "build a better world" and "bring hope back to this place." Coming from a kid who has no home and no future to really look forward to it actually seems like MK's best decision is staying with Pilgrim. When they get back to the island, we see Cressida with a bowl of red paint (or is it supposed to be blood?) furiously making red lines on a canvas. She groups them in bundles of five and spaces them all out. As she is doing this, we see MK walk out and he is now dressed in Pilgrim's ceremonial red and orange colors signifying he has officially joined his cause. He steps up to the canvas with Pilgrim and they stare at her work, but MK knows exactly what it is. He tells them it is the tattoos of a Clipper and this one is the man that murdered his mother-the man he is going to kill. Pilgrim snaps at him and says, "No!" because he foresees that the person's destiny is significant to his own so they need him. He tells MK that they must welcome him "like a brother." That just made things better for Sunny at least. How do you think Pilgrim and Sunny are meant to work together? What will happen with the Widow capturing Castor? And what the hell is with Sunny and those crazy flashbacks on the boat? We have to wait until June when Into the Badlands returns on AMC. But I bet it will be worth it!